I deeply believe that before we begin to process the trauma that lives within our minds, bodies, and being that we need to learn how to self-soothe and self-regulate in ways that are beneficial to our process and Self. I currently have over two dozen of these practical exercises that I share and am adding to the repertoire almost weekly. When you work with me individually or participate in either the TIE™ Basics or Trauma Informed Embodiment (TIE)™ Level 1 programs you receive a pdf of all the exercises I have gathered together to date. Place your right hand over your heart so that the heel of your hand is at your heart and your fingertips are at your collarbone. Apply as much pressure with your hand as you need/want. You can also put your left hand over the top of your right to apply more pressure. Alternatively place your left hand on your abdomen so that your pinky finger is just above your belly button. Apply pressure at your belly and heart at the same time. Your right hand is applying pressure to your polyvagal nerve, which is main parasympathetic system nerve. It is the nerve system that is responsible for our “resting” functions, like digestion, salivation, relaxation. By activative this nerve you are sending a message to your body system that you are safe and allows your entire body to begin to relax. 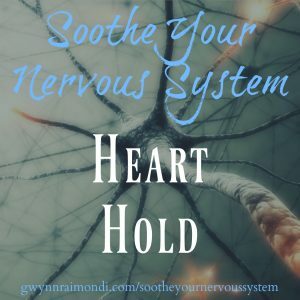 (Note your sympathetic nervous system – responsible for fight, flight, & freeze – cannot be active at the same time as the parasympathetic, so by activating the parasympathetic system you help to “de-activate” your sympathetic system. You can do this at anytime. It also can help to relax you at bedtime and help to quiet your mind.